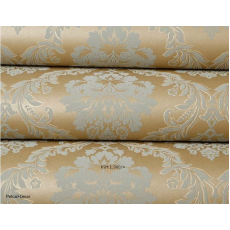 With a wide-ranging collection of golden floral design wallpapers, we are able to provide clients with a variety of styles to suit any given interior. All we need is an account of your interior, and we shall not only sell wallpapers to you, but also provide the necessary guidance on the suitable color and flower size you should consider. Our designers are highly qualified, therefore be sure that the assistance that accompany the sale is purely professional.